New York, United Nations: On November 3, 2008 the first Conference of States Parties on the Convention on the Rights of Persons with Disabilities (CRPD) elected the new Committee on the Rights of Persons with Disabilities which will be in charge of monitoring the implementation of the CRPD. The Committee comprises seven men and five women, of which nine are persons with disabilities. 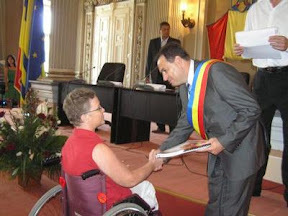 The 2008 theme of the International Day of Persons with Disabilities is "Convention on the Rights of Persons with Disabilities: Dignity and justice for all of us". This year, again, the Swiss FIMITIC member association Procap (the former Swiss association of invalids) is partner of the online-Advent calendar on sustainable development 2008. You can simply open a new window every day and learn something interesting and participate as well in competitions. Brussels, 3 December 2008 – European Disability Forum (EDF) made public its 2009 European Election Manifesto “Nothing about Disabled People, Without Disabled People” today, the International Day of Persons with Disabilities. The Budapest Hotel Panda is situated in the green Buda Hills and was recently renovated. The owners of this hotel have decided to give job opportunities to those who don´ t get them very often. Most of the employees of the Hotel Panda are handicapped. On 2 July, the European Commission adopted the long-awaited "social package", containing 19 initiatives in the areas of employment and social affairs, education and youth, health, information society and economic affairs. The renewed social agenda is part of this package. According to the Commission, the package "represents a new commitment to social Europe and consists of an integrated approach bringing together various policies. It shows how the EU can help to create opportunities, provide access and demonstrate solidarity". The Social Platform selected the main events of the French presidency that relate to social issues.